I' m sorry I should have said your favorite pleco or plecos. 1st is a honey cone bn, the 2nd is a vampire, the 3rd is a plain old bn (Mr. Agley) Lets see yours. Can you name the various varieties that you have? I am not too familiar with the species. You have some really nice ones. I have several varieties of plecos but I rarely see mine. I guess they are nocturnal or generally shy. 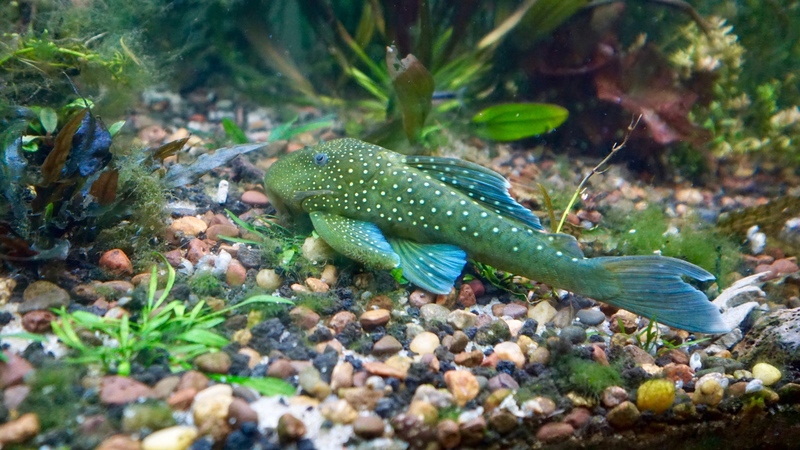 The one I do see a lot of is my Blue Phantom Pleco that is 8 inches. He cannot hide from me very well. Actually, he is very busy during the day and is not shy. I never see them unless I move some wood aside. I donty think IO even have a picture of them. I have this very small pleco in my 180g ( L201) that I rarely see that is so beautiful that it makes me mad that I put it in the big tank where it can always hide. I do see it ( just saw it yesterday) but it comes in and out of hiding places. Its maybe 2 inches long. Also, I have 3 Long fin- Calico ancistrus. This makes me realize that I really need to work on trying to get pictures of these guys. Wow, that phantom is really nice! Most of the pretty plecos hide all the time. I have 4 king tigers that I see once a month if I'm lucky. The only ones I see more often are the red and albino bn's. Hiding is the main issue I have with plecos. (large bio loads, too) Some of them are so beautiful (and I'm tempted often) but it's hard to appreciate them when you never see them. I've had the albino BNP and brown BNP and have bred them in the past. Having them breed is easy and fun, until you can't get rid of all the fry. I have only one brown BNP now which was a fry I missed when I finally sold all my others. He spends all of his time in the middle of a massive anubias under different leaves. I only know he is even still there when the zucchini is decimated overnight. I think the trick may be to get plecos that get larger. Above 6 inches. But then you have to have a tank of at least 55 gallons to put them in. find the browns almost impossible to even give away, even thro it's one of my favorites. I don't have them anymore, but my tiger plecos L002. I had to rehome them :bcry: because they were sucking on the sides of my angelfish at night. They were so beautiful in my tank. They were not seen during the daylight hours either though. They slept in an artificial DW log, it was actually the way I ultimately got them out of the tank. I think they were breeding, or getting ready to and that's why I never saw them during the day, but I never saw eggs or fry. The one thing that seems strange to me is plecos having the rep of huge bio loads. I have 12 breeder size LF reds in a 75 gallon ( only 1 male of course) and the tank really does not require any extra maintenance compared to my other tanks. The picture I'm posting is of a 39 gallon, that I never had a problem, I only changed half the water every 3 days. The only thing I notice is more nitrates in the pleco growout tank, so I have to change out water often. In my dirted tanks, plecos don't make a hiccup. If the biological system is in tact, it's only the typical nitrification biproduct to deal with. In my dirted 90g with 3 adult plecos and some babies, the nitrates are processed anyway.